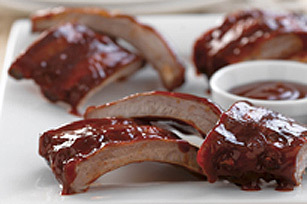 The secret to this ribs recipe? The BBQ sauce is spiked with orange-flavored KOOL-AID mix—and the whole thing is grilled to falling-off-the-bone perfection. Place half the ribs in single layer on large sheet heavy-duty foil. Mix barbecue sauce and drink mix until well blended; pour half over ribs. Bring up foil sides. Double fold top and ends to seal packet, leaving room for heat circulation inside. Repeat to make second packet. Grill 1-1/2 hours or until ribs are done. Transfer ribs to platter, reserving sauce in packets. Skim fat from sauce; serve with ribs. Serve with hot steamed vegetables and whole wheat bread. Heat oven to 350°F. Place ribs in single layer in roasting pan. Pour sauce mixture over ribs; cover. Bake 1 hour 45 min. or until ribs are done, uncovering for the last 15 min. Transfer ribs to platter. Skim fat from sauce; serve with ribs.